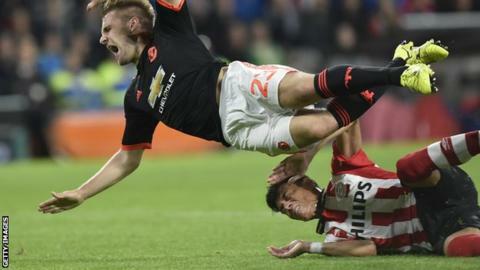 Manchester United's Luke Shaw will leave hospital in the Netherlands on Saturday after a visit from the player whose challenge broke his right leg. PSV Eindhoven defender Hector Moreno and coach Phillip Cocu visited him at the hospital in Geldorp on Friday. Defender Shaw, 20, is recovering from surgery on the double fracture he suffered in the 2-1 Champions League loss on Tuesday. "Hector is really distressed his opponent was so badly hurt," said Cocu. "We first asked whether Shaw would meet us, which he wanted to," Cocu told Dutch media on Saturday. "We offered him the help of PSV should he need anything in relation to his recovery." Cocu said the incident had weighed heavily on Mexico international Moreno, who suffered a broken leg at last year's World Cup in Brazil. He told reporters: "It has affected him, it has affected the others and it has affected me." Cocu also said the defender had no intention of injuring the Manchester United man. Moreno issued an apology the day after the game. England defender Shaw posted images of himself with hospital staff on his Instagram account. He wrote: "I just wanna say a massive thank you to everyone at St Anna hospital for all the care and attention they have given me the last few days. Something I will never forget! Am pleased to be flying back to Manchester today so I can start my journey back onto the football pitch!" Manchester United manager Louis van Gaal said Shaw's season was "nearly finished" after Moreno's tackle.